Happy Holidays to all my readers! Christmas is seven days away, and I’ve been busy in the kitchen making doughnuts, namkeen (Indian salty crackers), coconut ice candy, and my all-time favorite – almond brittle. 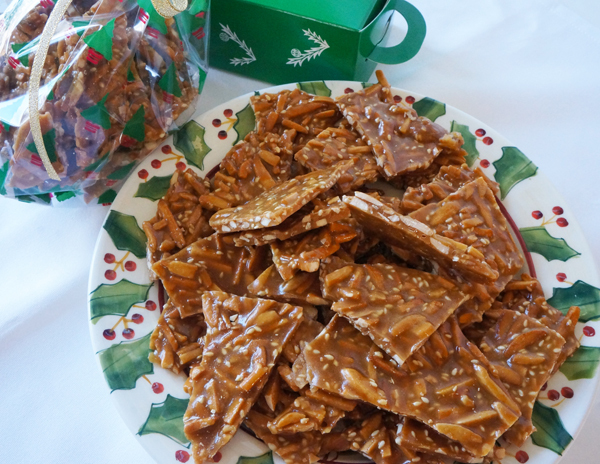 I’ve been making almond brittle for my friends during Christmas for years, so I thought I would share the recipe with you. But, before I do, let me tell you about the person who first taught me how to make almond brittle. Sarojini Raj is her name, but to me she will always be “akka”, which in Tamil means respected and cherished older sister. I learnt so much from her. I learnt about unconditional love, and giving without expecting anything in return. I watched her manage her time efficiently. She kept an impeccable home while working full time, cooking three meals a day, and the list goes on and on. Thank you, akka, for your love, and for being such an amazing role model to me.